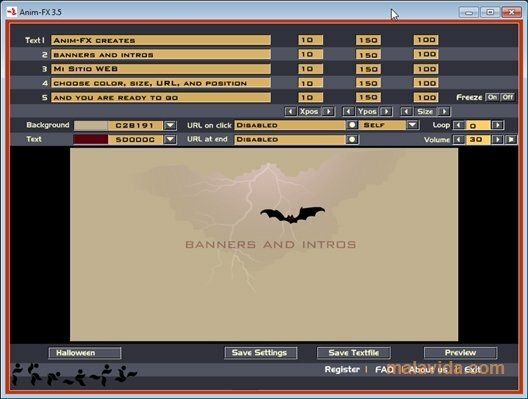 Flash animations make websites lively and dynamic. Thus, this can be a good technique if we want to highlight the title or some kind of change to the contents of our website. To easily generate animated texts we can use an application like Anim-FX. Anim-FX is a specific application for the creation of animated texts, that includes the possibility to choose between a great amount of original effects. Due to the latter, it's the perfect tool to include interesting animated presentations and publicity banners in your Internet projects. 2. Choose the banner text. 3. Select the background color and the appropriate color for the text. You can also indicate a specific position and link the text with a URL. This trial version has certain limitations.